Valentine’s Day came slightly early for a pair of north-east “lovebirds” who were separated days away from the birth of their offspring. Animal enthusiast Julianna Magalhaes keeps 45 feathered pets in an aviary in the garden of her home in Buckie, and was left frantic with worry when a male budgie escaped while her husband was cleaning the coop on Saturday. The bird does not have a name, but it does have a “girlfriend” and the animal’s decision to fly the nest came just a week before the expected hatching of his chicks. Mrs Magalhaes said that the mother of his children was left heartbroken by his departure. The 28-year-old, who has an eight-month-old daughter, said: “My husband only left the door a little bit open, and he flew away. More than 24 hours of anxiety came to an end this afternoon, when the Buckie branch of the Coastguard service found the bird outside its base, about a 15-minute walk away. 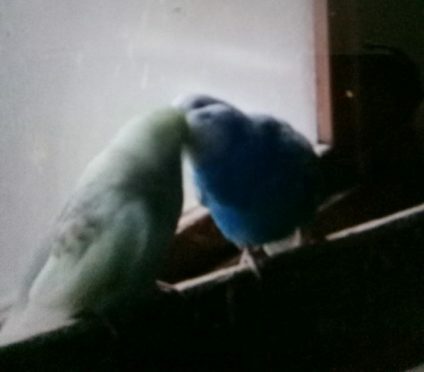 Upon reuniting the absconding budgie with its partner, Mrs Magalhaes was astounded when the lovestruck pair began to “kiss” and quickly snapped a few photographs of the peculiar peck on the cheek. However, another bird which took flight at the same time as the blue budgie remains missing. Mrs Magalhaes, who is originally from Portugal, said the still-missing bird is white in colour and is hopeful that it can be found soon. Anyone who spots the budgie and suspects it may belong to the family has been asked to call 01542 663034 to speak alert Mrs Magalhaes.